For the last four years, I've been watching videos about people with down syndrome. They often come into my Facebook news feed and people send them to me in messages and emails because, well, they're relevant. Now, of course, it's media, and people can broadcast whatever they want to make things seems just they way they want them too seem. But there are some things you can't sugar coat. Somethings you can't fake. And most definitely, feelings that you can't make up. I've shared some of these videos with you already, but here is one for this week that has crossed my path a couple times lately. I love this little girl's spirit. And confidence. And her ability to be her own advocate. It makes me so proud of her, and I don't even know her! In a way, however, I do know her -- because I know Braeden. And I have a feeling he will be his own advocate too. As for me, I'm trying to advocate for everyone. I believe that we all have a beautiful purpose, and once we are not influenced by greed and illusions of reality, we can let it shine. 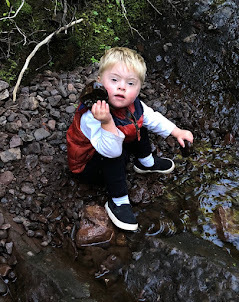 Our friends with Down syndrome will be able to help us see this path because they are such a pure and vibrant life force. They hold the key to how we can learn to do our part in this world. All we have to do is watch, listen and learn.